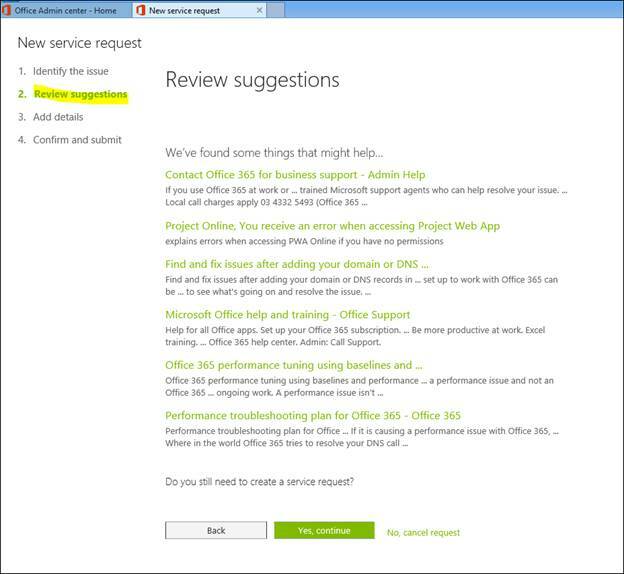 In this article, you will learn how to create a new service request on Office 365 support for business support. 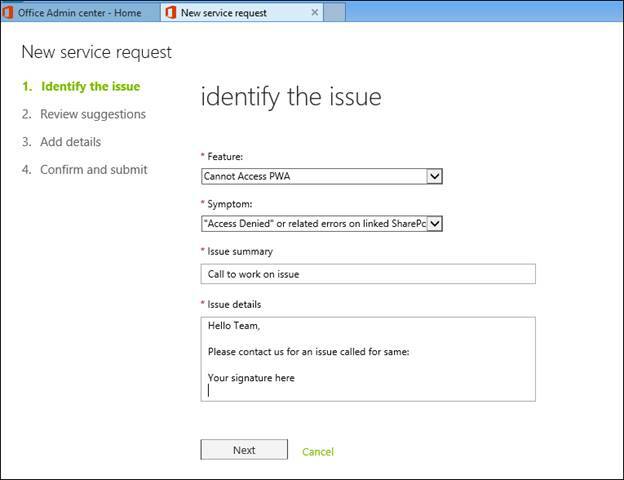 Today, I am writing about how to create a new service request, which we will call SR to Office 365 for business support. As an admin for Office 365 for business, we get free access from MS support team to help resolve technical issues as well as for sales and others services also. We can contact Microsoft support on behalf of the organization, so you should have access to raise the request and see the update as well. Being an IT admin, we need to frequently create new service requests to Microsoft as Office 365 keeps on updating its product and features. I have noticed many times the features which are available in SharePoint On-Premises or other products are missing or updated for Office 365. Thus, let’s start step by step creating with screenshots. 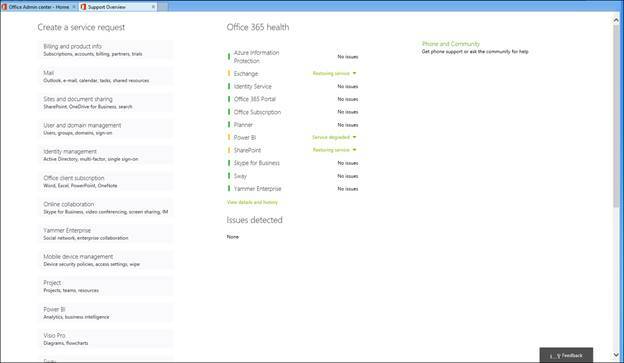 Login to Office 365 portal page, if you don’t have permission to access Office 3665 admin page directly. On the screen mentioned above, it will ask us to login with the user account and password. Thus, just enter authorized used Id and password and click on sign in option. It will login to Office 365 Admin Center landing page. Here, we can see many options will be available like Home, Users, Groups, Resources, Billing, Support, settings, Reports, Health and Admin centers. Here, we need to select Support option, it will expand with two options called support and Service requests. We can create New SR with support and Service request options. 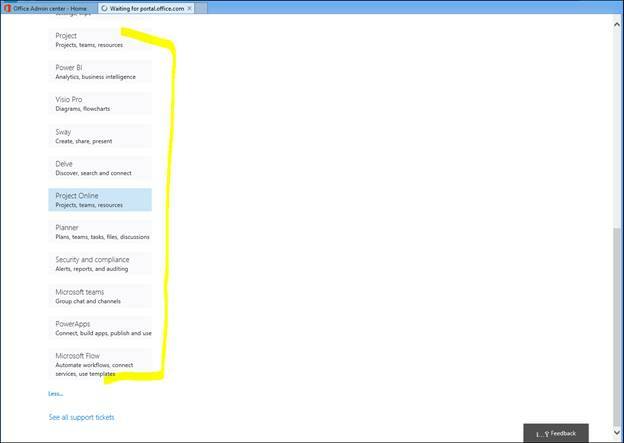 Now, click support options to create new SR and select a Service requested, as given below. If we create on support, the option will take us to the support overview page. If we click on the Service requested, it will take us to the support page, where we can see opened ticket details. Here, select + button to create a new service request. This page will also take us to the Service page. Here, we need to expand all from the default Services. Here, we need to select your service if we are going with Project online support. Just click Project online option. After clicking the above, it will take us to the New Service request. Here, we need to select the details, mentioned below. After selecting above, the option given below will appear. Issue Summary- Enter your summary. Issue Details- Describe an issue. Once you select Next, it will take us to a review suggestions page. If it works, select it and see if you can fix it by the given link or select yes to continue. Once everything is done, click on next button. Here, we need to add the given details, as mentioned in the screenshot. We can attach a file or error screenshot here. At a later stage, you can also add the same. Once everything is done, as shown above, click on next button and you will get confirmation, followed by submit page. Here, we need to verify and submit the request. Now, we can see our request has been created. We can update other details, which still need to be filled out also after creating new Service request. Just open the created ticket and from the given ticket number, it will take us to the details page. Get the details option and we will get Notes in the left side of the screen. Select notes and here we can update our activity or the other details. Also, we can close the ticket at any moment by clicking on Close request. Now, we will get option Files at the bottom of the Notes option. Here, we can attach our screenshots or other documents. 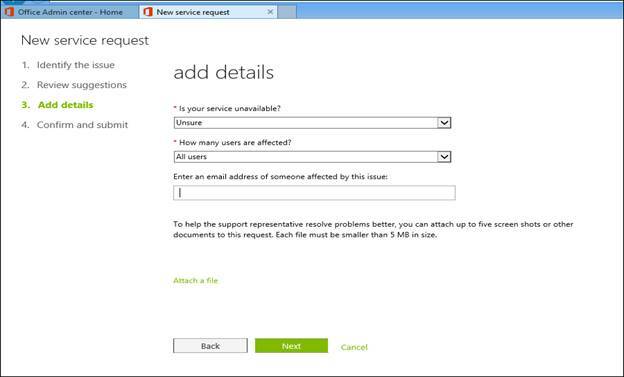 We used a step by step method to create the ticket for Office 365 business to get help from the MS support team.